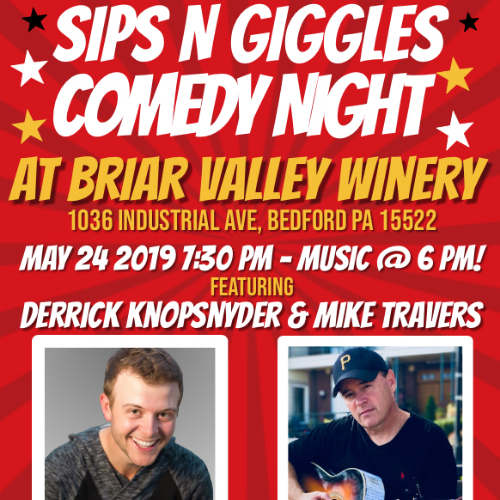 Come to our Winery to enjoy a night of great music by Coltt Lepley & Sipping & Giggling with comedians Derrick Knopsnyder & Mike Travers. Must be 21 yrs of age to attend this event. Musician Coltt Lepley will be our opening act from 6pm-7:15pm. Comedy Act to follow. Doors will open at 5:30pm, general seating. Feel free to bring dinner or snacks. We will be selling wine by the glass, or bottle. We will also have PA Microbrew beers. No other liquids will be allowed at our venue, but bring all the food you want. Must be 21 yrs of age to attend this event. © 2019 Central PA Tickets. All rights reserved.